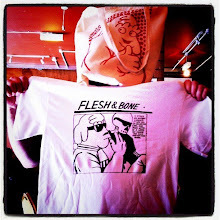 First Flesh and Bone of 2012? What the BORK! One needed time to sit back and assess. Flesh and Bone is back now, but will it meet the self-imposed Monday and Thursday new strip deadlines of yore? I can't wait to find out. See you...Thursday? Currently listening to : Fleetwood Mac "Rattlesnake Shake"